Imagine Zechariah’s shock when the angel announced the coming birth of his son. Zechariah and his wife Elizabeth had prayed for a baby, and now the prayer was answered. Unlike her cousin Elizabeth, Mary had not asked for a baby. She wasn’t even married. A young woman in Nazareth, engaged to Joseph—for her, babies would come with time, most likely. First the wedding, then the baby. Both Zechariah and Mary were confronted by an angel. Both heard the impossible news that a son was to be born. Zechariah and Mary were both troubled at the announcement, but the angel reassured them that their sons would be great and bring joy to many. They heard a similar announcement from the angel, but their reactions were not the same. Although both Zechariah and Mary questioned the news they received, God heard different responses. One was the response of unbelief. The other, a response of faith. Zechariah questioned how God could perform something that was entirely contrary to the physical evidence. He was old. His wife was old. In light of the angel’s announcement, how could he “know this” and believe in the face of the facts? Mary, on the other hand, didn’t ask how she could trust the message. Instead, she simply asked how God would accomplish this amazing feat given that she was still a virgin. Hers was a question rooted in faith. In our lives, we face circumstances that look impossible. A broken marriage after years of trying to make it work. A lost child that you’ve prayed for without ceasing. A rising mountain of bills and a shrinking or empty bank account. All the physical evidence may suggest that no solution is forthcoming. The hurts are too deep, the loss too great, the debt too high. Maybe, like Zechariah, you’re convinced that time has passed you by. While we can’t see the hearts of Mary or Zechariah, God knew that Zechariah’s question told of his unbelief, and God answered the question accordingly. God also knew that Mary’s question was a question of faith. She recognized God’s will, and asked how God was going to bring it to pass—a legitimate question. Mary trusted God with her future. The coming Messiah was the answer to a long awaited promise of salvation and deliverance, and though she didn’t know exactly how God would accomplish the birth of her baby, she trusted that would do what he said he’d do. So which response will you choose? Will it be Zechariah’s response, as you point to physical evidence and ask how you can be expected to believe God, given the facts? Or will you choose Mary’s response, and simply ask how God will accomplish his will? 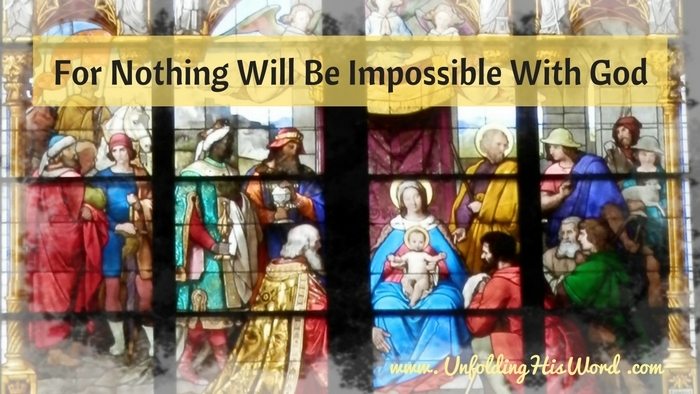 This Christmas, let’s choose the faith of Mary, for nothing will be impossible with God. This article first appeared on Unlocking the Bible, 21 Dec 2016. Used by permission.